T. T. Wiley (1908 – 1999) was born in Champaign, IL in 1908. Son of a civil engineering professor, he earned his civil engineering degree from the University of Illinois. Mr. Wiley was one of the first traffic engineers in NYC since 1948. He then became the first traffic commissioner of the City. 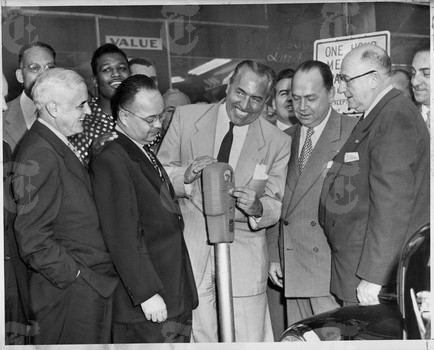 Mr. Wiley was instrumental in implementing the first one-way traffic streets, walk/don’t walk signs and parking meters in the City.He was adjunct professor of civil engineering at New York University during the 1950s. In 1963 he started his own business, T.T. Wiley and Associates, where he was an engineering consultant. He won many awards for his contribution to the industry including the NY Citizens Traffic Safety Board Award. Since 1981 T.T. Wiley and Associates have been working on the Integrated Motorist Information System (INFORM) on Long Island which provides traffic surveillance and information for motorists throughout Suffolk, Nassau, and Queens Counties. Mr. Wiley’s first wife, Lyrrell (Sutton), died in 1981. He married Bernice (Silling) in 1983. Mr. Wiley has three daughters. He was choir director of Douglaston Community Church in Queens. THOSE WERE THE DAYS, MY FRIEND ………….. 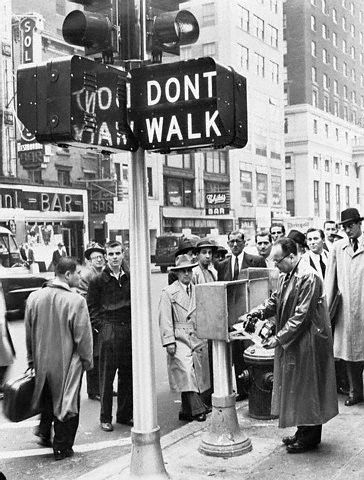 Along the lines of pedestrian signals, there were several kinds that were in use in New York City over the years. The first of its kind was introduced in Manhattan in the early 1950s. It was rather skinny, not to mention horizontal, in appearance, and its source of illumination was neon. 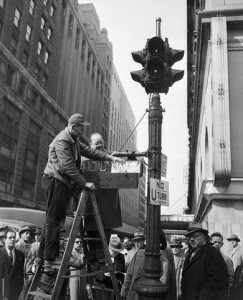 Manufactured by the Crouse-Hinds company, this pedestrian signal was near and at Times Square, and roughly ten were in useful service for a short period of time. At the time of their introduction, they operated along with two-section (red and green) vehicular traffic signals. Below, is a photograph of an example. In the photograph, then traffic commissioner T.T. Wiley (man below the installer with hat) helps a worker install this kind of pedestrian signal at Times Square, while a group of people below them watch. It was not until in 1955, though, that a new kind first appeared on the streets of the city. It was a rather bulky, not to mention very heavy, pedestrian signal that was manufactured by the Winko-Matic company, and its illumination source was neon as well. Below, is a photograph from 1955 that shows a newly installed (then) pair at the corner of 7th Avenue and W. 35th Street. In the photograph, then traffic commissioner T.T. 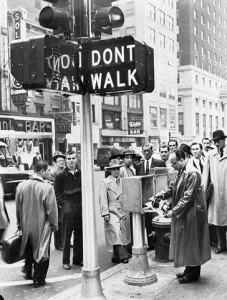 Wiley (handling the signal controller below the pair) activates the signals for the first time, while a group of fellow New Yorkers around him watch. 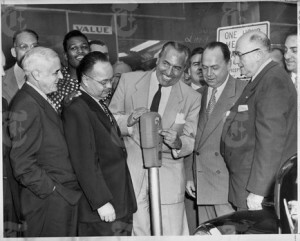 The first 300 were installed in Manhattan, while others would spread throughout the rest of the boroughs in later years. From what is known, New York City installed these pedestrian signals until the early 1970s. At least two other kinds from possibly the Winko-Matic company were installed in the 1960s and 1970s in certain locations of the city, and these remained in service until the early 1980s.